The Sarjeant Gallery’s artist-in-residence programme at Tylee Cottage is one of the longest running residency programmes in the country and has seen more than 40 artists participate, all of whom have made valuable contributions to the Gallery’s exhibition programme and the permanent collection. Auckland based artist Sam Mitchell is the first in the 2015-2017 round of artists in residence at Tylee Cottage. 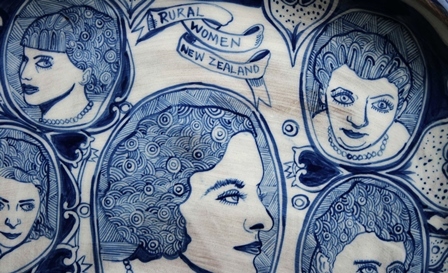 Sam will be in Whanganui until early December 2015 and during her time here she plans to undertake a project that will coincide with the 30th anniversary of the residency in 2016. 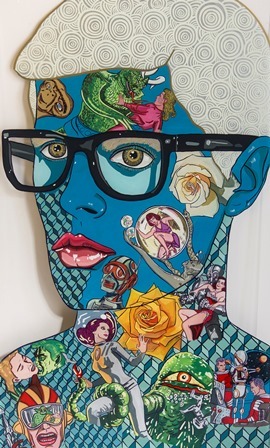 Sam Mitchell completed a bachelor of Fine Arts, Elam School of Fine Arts, University of Auckland in 1997 and since graduating has regularly participated in solo and group exhibitions in public and dealer galleries and in 2010 she was the Paramount Winner of the James Wallace Art Award. Mitchell is no stranger to residencies and this is her second in New Zealand with the first being a six month residency that she undertook as the William Hodges Fellow in Invercargill in 2014. She found that her time in Invercargill gave her the opportunity to look at aspects of local history and life and comments: “I like peering in from the outside and residencies allow me to live and work in a community, knowing that its only for a fixed period of time which allows you to keep some distance”. Like Invercargill it was Whanganui’s rich cultural history that appealed to Sam and also that the residency programme at Tylee has brought so many artists to the town. During her time in Invercargill, Mitchell absorbed local history and particularly the city’s strong Scottish heritage that is still present today in the city’s street names and the descendants of early settlers. With her work normally having a strong narrative component the residency allowed her to expand on this by reflecting stories from Invercargill in her work. Although Mitchell normally works in paint, a phone call from a local potter and an introduction to the local potters’ society allowed Mitchell to add a new string to her artistic bow – ceramics. She found the medium of functional ceramics was well suited to the stories she wanted to tell and what resulted were a series of highly decorated platters and plates that often subversively reflected elements of her observations of the place. 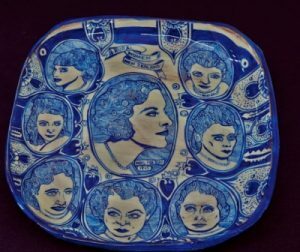 Mitchell adds that she likes the idea of using ceramics as the idea of someone being able to eat off a ceramic object that illustrates a piece of local history is appealing, and that you certainly couldn’t eat off a painting. Tying in with the 30th anniversary of the residency at Tylee Cottage in 2016, Mitchell is using 1986 as a starting point for her research for a new body of work that will delve into unexpected or forgotten elements of local history. Some of these may have had no lasting effects and others, like the establishment of the residency programme, have had an ongoing impact on the makeup of the town. Having arrived at the beginning of the month Mitchell has already joined the local potters’ society and has begun work. We look forward to seeing what comes from the residency at the end of the five months.